Update: I’ve now created an online 3D model of the station so you can “explore” it from the comfort of your browser. Click here to see it! Sometimes, you get the chance to finally explore somewhere you’ve been desperate to get inside for years but thought you’d never be able to. In the past few months I’ve been lucky enough to have two of these chances: namely, Scotland Street Tunnel in Edinburgh, and now Botanic Gardens Station in Glasgow. 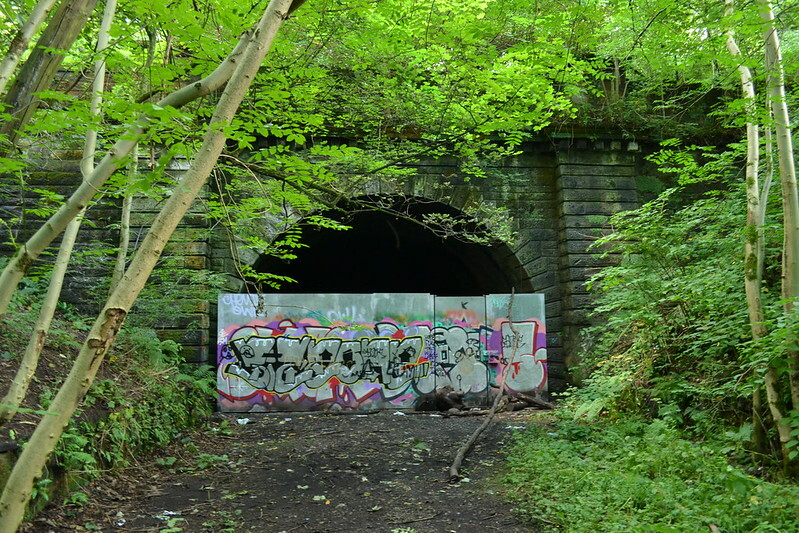 In fact, on this explore we actually traversed two derelict tunnels (Botanic Gardens and Great Western Road) and saw three abandoned stations (Kelvinbridge, Botanic Gardens and Kirklee). 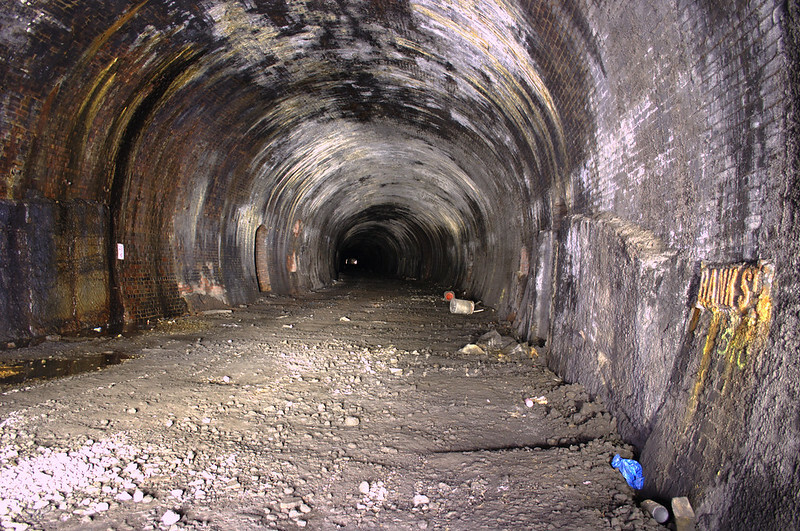 The number of stations and tunnels in Glasgow named “Kelvinsomething” can get quite confusing; there are tunnels named Kelvindale, Kelvinside, Kelvingrove and Kelvinhaugh (all but the last are now disused). 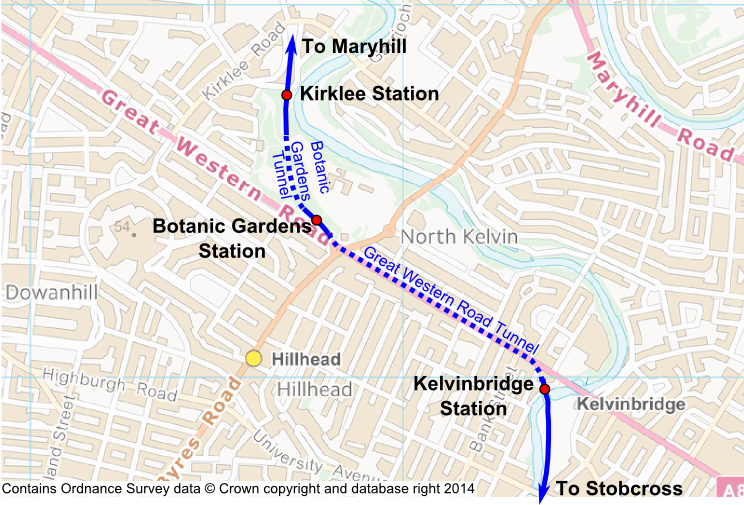 There is also a Kelvinside Station which is right next to a tunnel, but not the Kelvinside Tunnel! Kelvinbridge doesn’t have a tunnel named after it, but it makes up for it by giving its name to two separate stations: one still in use on the Glasgow Subway, and the other a former station on the old Glasgow Central Railway. The earliest part of the Glasgow Central Railway ran from Stobcross to Maryhill, and before it was even completed in 1894, the company had been swallowed up into the Caledonian Railway’s ever-expanding empire. This section of railway ran mostly underground, through tunnels that are still in place today, and there were three intermediate stations. The line closed completely in 1964, though the three stations had already been closed for years by this time. At Kelvinbridge, the line crossed the river on this wide low metal bridge, now part of the Kelvin Walkway. The station platforms once extended over the bridge. 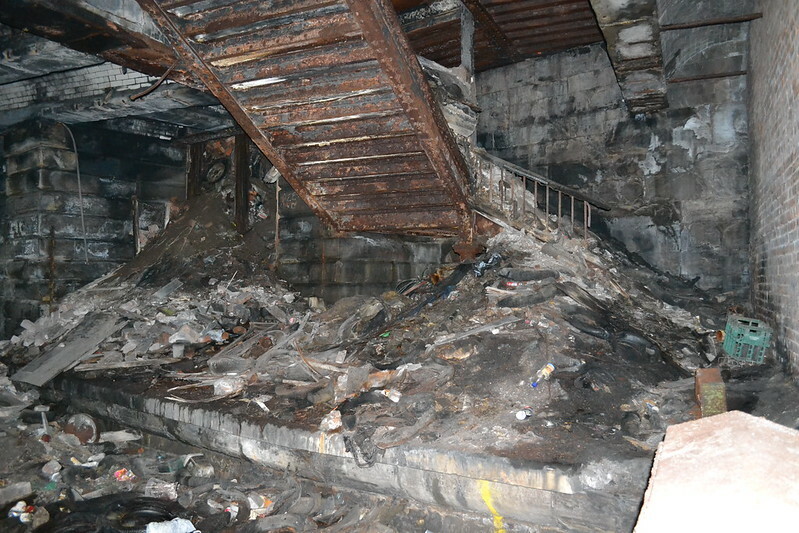 … on the other side, parts of the platforms and steps that used to give access from the main building up above still survive. The whole area is now piled high with rubbish and not particularly picturesque. We didn’t spend long at this station. At the back of Kelvinbridge Station, the line passes through a short cutting and into the Great Western Road Tunnel. This tunnel is 700 yards long and, apart from a bend at each end, is exactly underneath the road of the same name on the surface. A boxed in sewer passes overhead just inside the tunnel mouth, demanding some unusual skewed brick work in the tunnel lining. The tunnel is very quiet and calm, and as we walked through it was hard to believe that one of Glasgow’s busiest thoroughfares was just metres above our heads. A rusted sign on the north wall indicates the position of Bank Street, one of the few clues to what lies above. The tunnel was reasonably dry compared to some. Of course, it has to be maintained in good condition for the safety of the busy street up above. 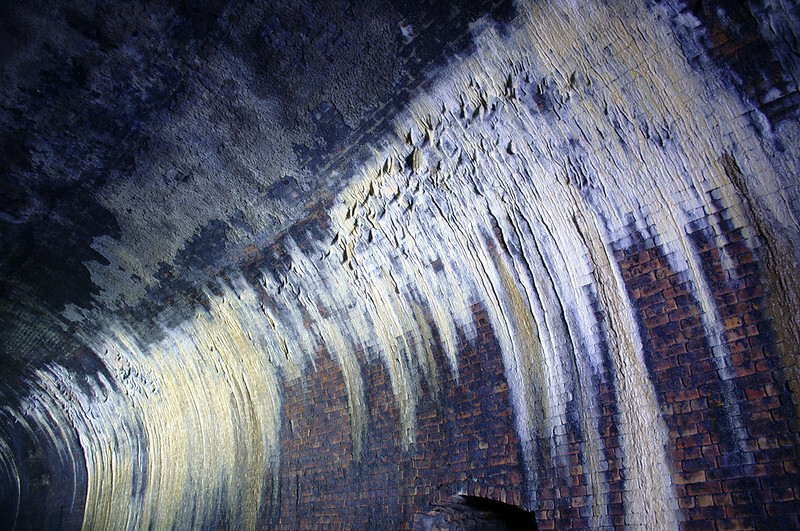 In places, stalactites had started to form in the minerals dripping through the roof. At its western end, Great Western Road Tunnel leads straight into the highlight of our day: Botanic Gardens Station. 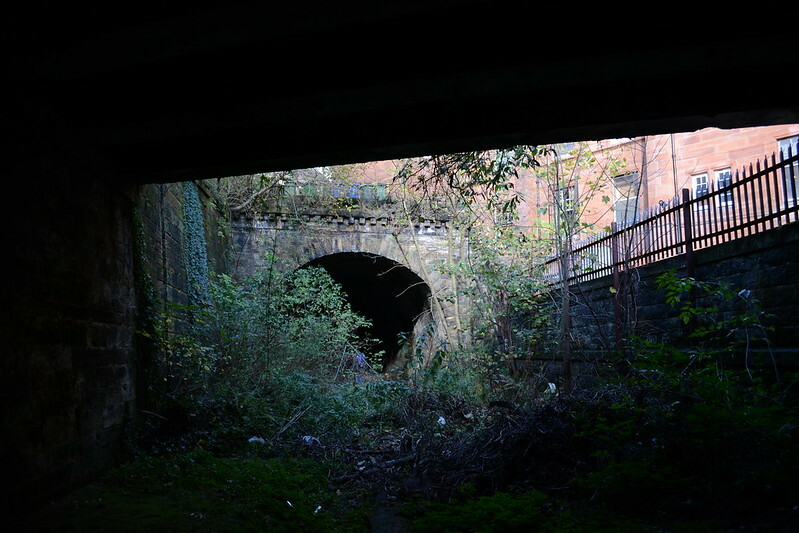 There is a short section of cut-and-cover tunnel with flat metal girder roof between the brick-lined bored tunnel and the open space of the station – this is where the line passes beneath the busy cross roads outside the Gardens. Botanic Gardens Station closed in 1939. The impressive pavilion-style main building on street level had a variety of uses from then on, but unfortunately it was ruined by a major fire in 1970 and then demolished. 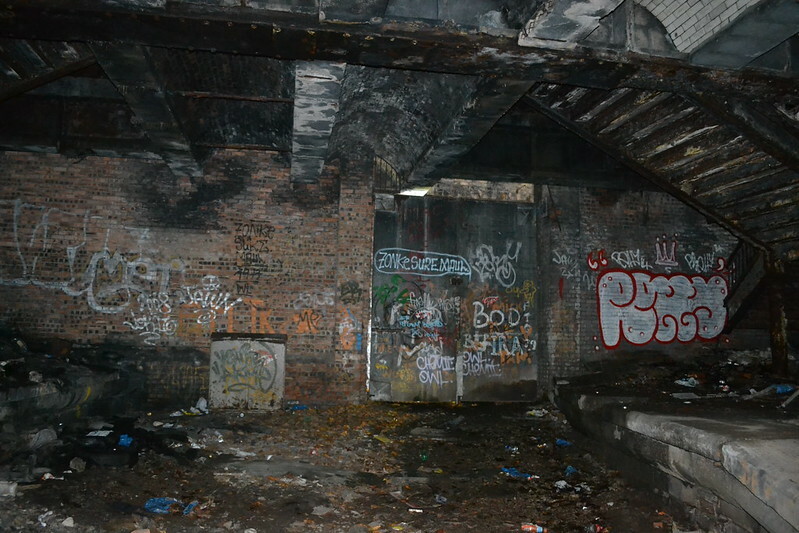 More recently, a plan was put forward to build a replica of the station building on the original site, housing a nightclub, but opposition to the idea of a nightclub in the Gardens put an end to this. Today all that remains are the subterranean platforms. Visitors to the gardens can look down through the ventilation openings onto the platform area below, and a sign on the railings explains what they are looking at. 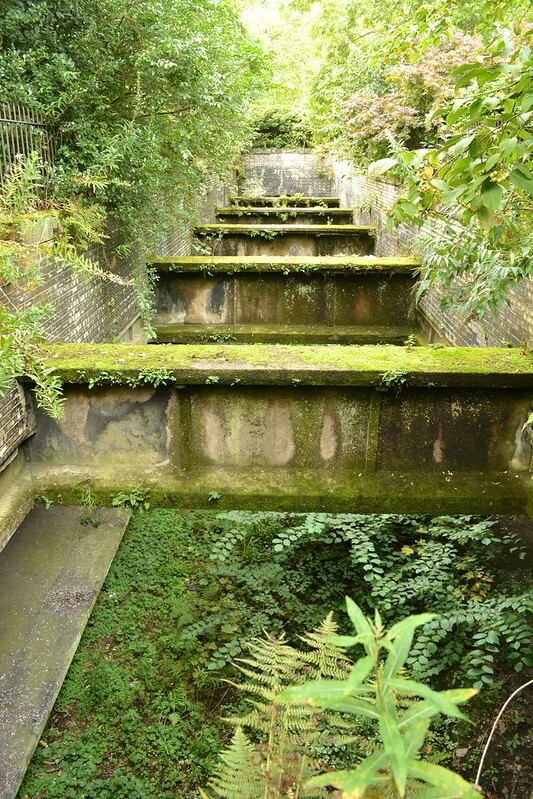 The very top of the Botanic Gardens Tunnel portal can just be seen in the brickwork at the far end. 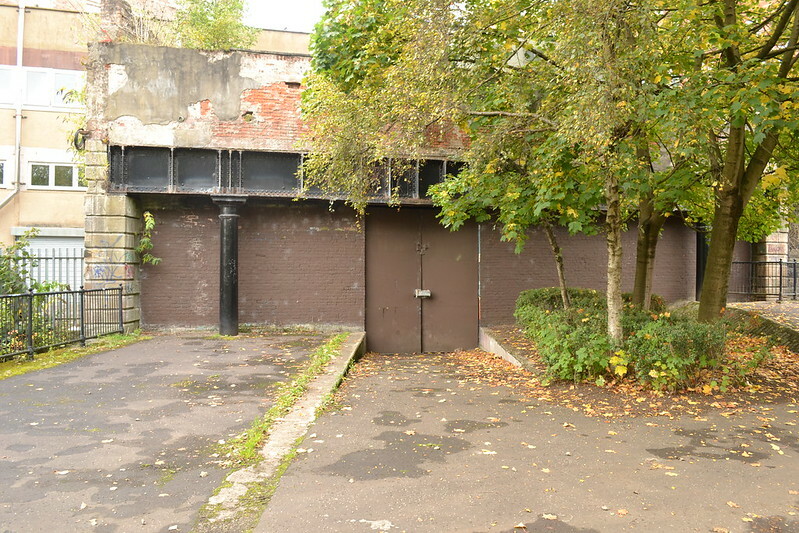 There are three ventilation openings, one just inside the gardens and the other two further in, with the station building originally standing between them. Viewed from platform level, the station is a sight to behold. Although the tiled walls are coated in graffiti and the trackbed is now seriously overgrown, there is plenty of interest still to see. 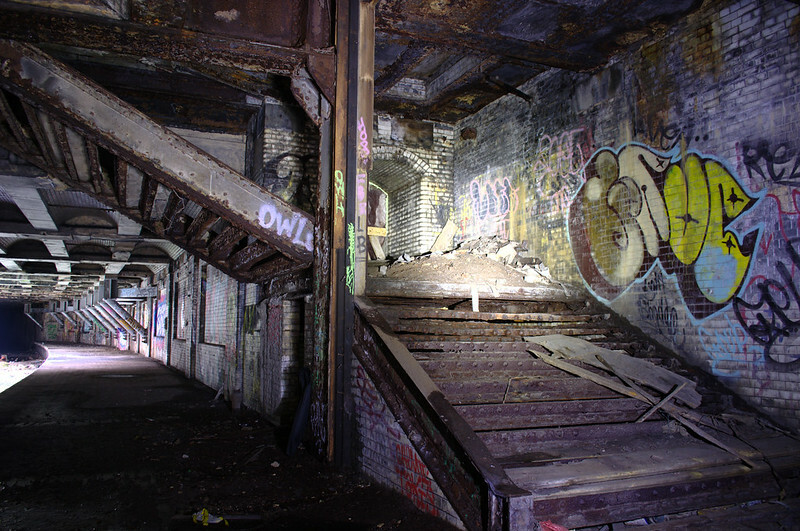 The stairs that gave access down to the platforms are still in place on both sides, though since the loss of the main building they are now blocked off at the top. At the eastern end of the station is a more recent development. These sturdy metal brackets have been installed to strengthen the roof as it nears the busy road junction up above. 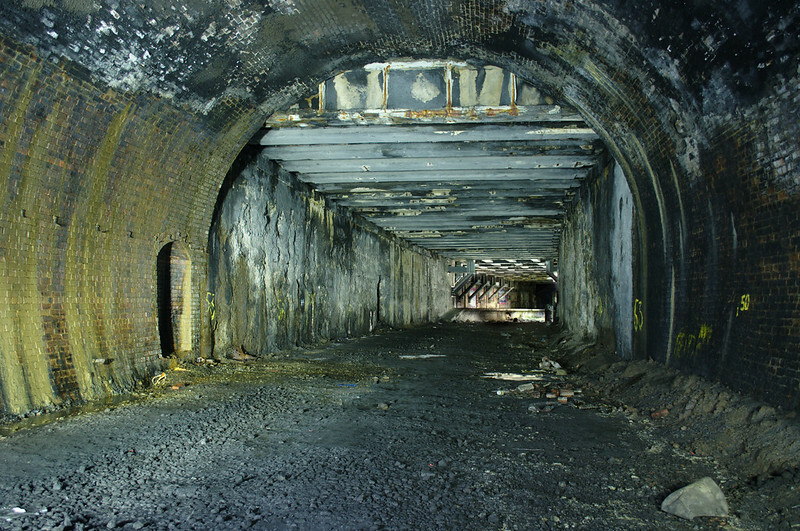 At the western end, the line disappears into another tunnel – the Botanic Gardens or Kirklee Tunnel. 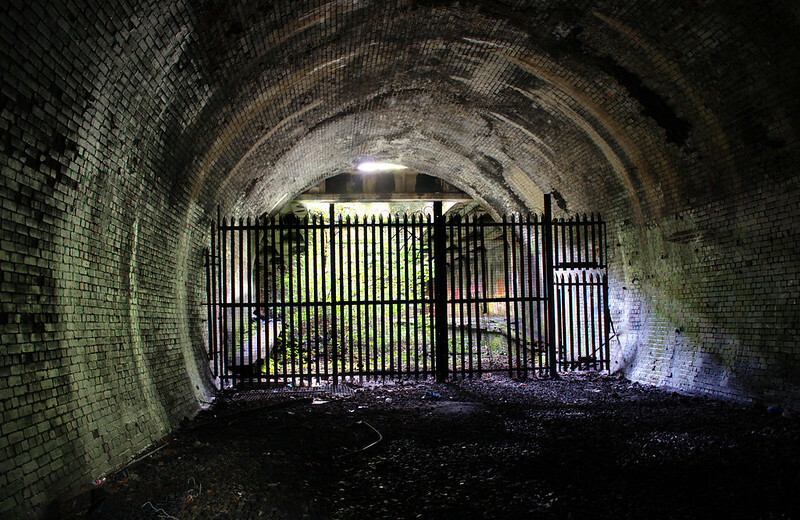 The photo above shows the view looking back through the fence into the station from this tunnel. 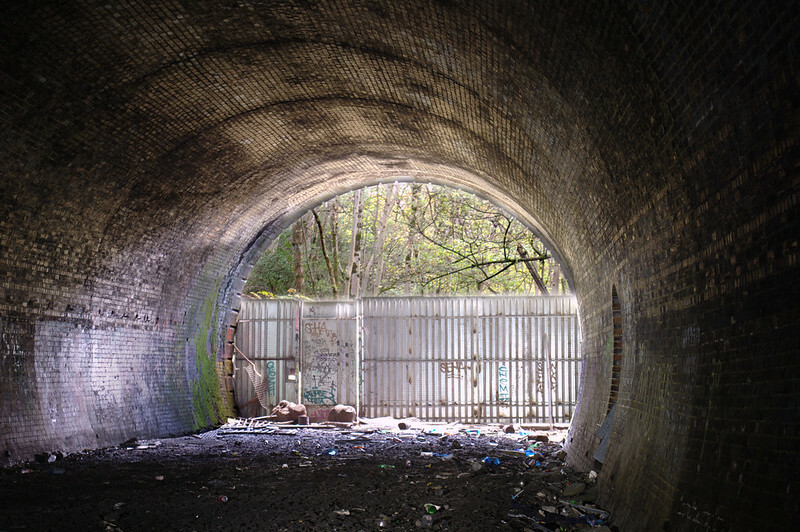 At just over 200 yards, Botanic Gardens Tunnel is much shorter than Great Western Road. 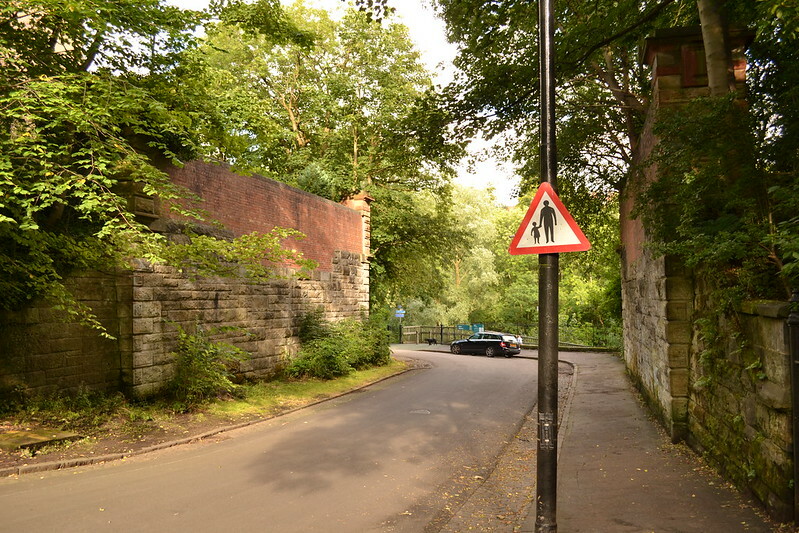 It burrows underneath the Gardens themselves on a gentle curve round to the north, exiting into a leafy cutting by the River Kelvin. 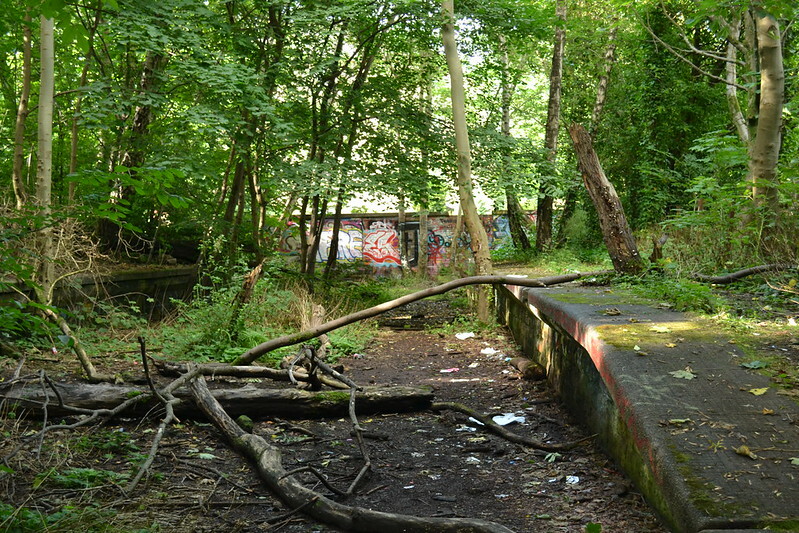 A short distance from the portal, the disused and overgrown platforms of Kirklee Station can still be seen. These two stations were unusually closely spaced and even on foot it only takes a few minutes to get from one to the other. The line continued north from here to Maryhill. 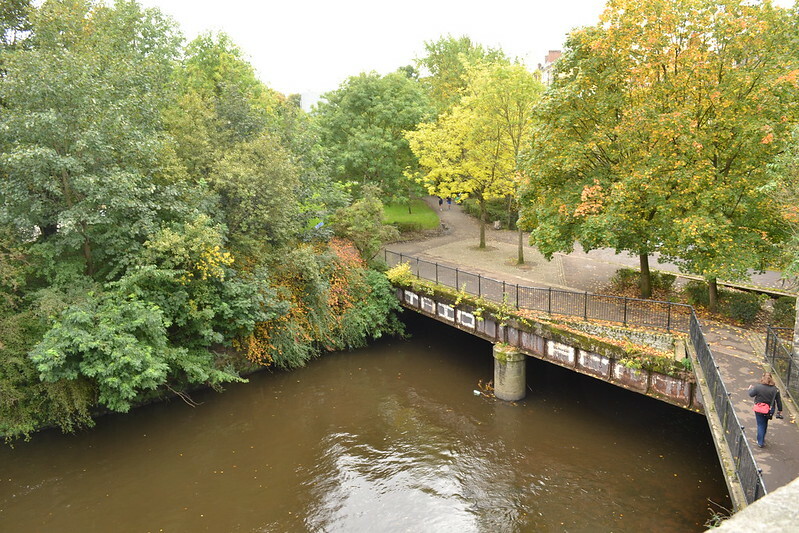 Much of it has been built over, but there are occasional remnants still visible – for example, the abutments of this bridge which used to take the railway across Ford Road, just outside the Botanic Gardens. I think I went a bit overboard on the photos this time, sorry! But I found this location so interesting that I wanted to cover it in as much detail as possible. Thanks for these fascinating photos–not overboard at all. Do you know what the archways now occupied by the Inn Deep pub were originally? I had assumed they were part of a rail or subway line, but I can find no photographic or cartographic evidence of such. Due to their construction and their closeness to the old Kelvinbridge Station, it seems likely they were something to do with the railway. I don’t think there were ever actually tracks in them though, as none of the old maps I’ve seen show anything like that and the layout on the ground today also makes it look unlikely. It’s possible they were built at the same time as the station and used for storage or similar. 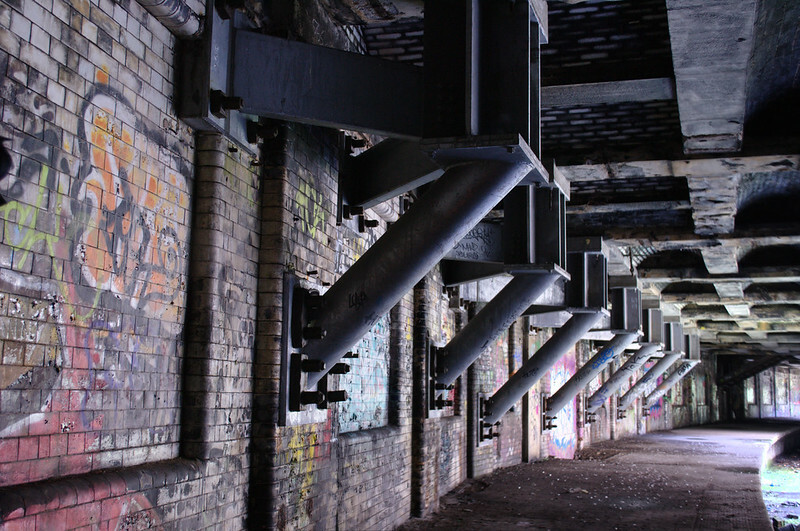 Been along those tunnels many years ago – they’d make a great set of art galleries! Not over board on pictures at all! It looks really interesting and would love to go and take some of my own snaps. How is it you got into the tunnels? How can I get to Botanic Gardens Station and snap some photos there? It’s difficult to get in there these days, unfortunately… as far as I know both ends are securely fenced up right now. 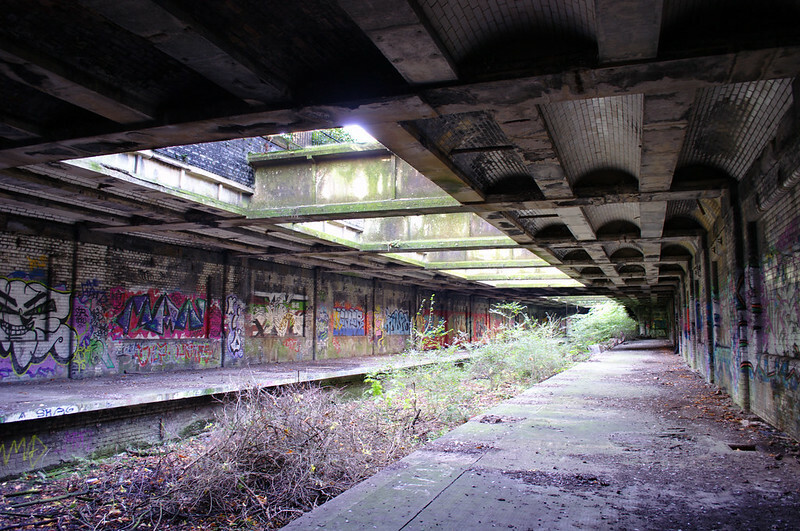 I would be interested in taking some images on the old train platform under the botanics. The entrance in the botanics now has metal sheeting over it. Are there any other entrances in that aren’t boarded over? I don’t think so, unfortunately… realistically the only other way in is at Kelvinbridge, but that’s normally locked up behind big metal doors. Hi, photos look amazing! I’ve wanted to go into the tunnels for ages, particualrly to see the botanic station, how did you get in? No, we didn’t meet anyone else down there… did get a scare on our way out when we saw movement under the fence and it looked as if someone was out there waiting for us, but it turned out to be just a squirrel, thankfully. I don’t think there’s an easy way in at the moment, unfortunately. Both ends were pretty well fenced up last time I looked. Incognito, yes… we didn’t break in though, just did a bit of climbing 🙂 . There’s this map where someone has drawn all the disused railway tunnels in the west end area onto a present day map. There’s also the National Library of Scotland site which has a lot of older maps, some of them are detailed enough to show the tunnels – this one shows the two you mentioned when they were still in use. Me and my friends are meeting up tomorrow hoping to get into botanic gardens station. Do you think there’s a way in apart from going through the other stations? Lovely photos by the way! Realistically the only ways in are through the tunnel entrances as it’s a hell of a drop down through the vents! There’s some climbing involved though (unless you get lucky and someone’s left the door open). Good luck 🙂 . I’m doing my geography dissertation on the Botanic Gardens abandoned railway station and would love to ask you a few questions about your experience of it! if your interested could you give me a wee email please and I will let you know more about it. It would be great to hear from you ! Happy to help if I can 🙂 sent you an email. Really loved reading through this. I was hoping to get down there myself and take some photos. Would you be able to let me know the best route into the tunnels? Glad you enjoyed it 🙂 . I don’t think there’s an easy way in right now, unfortunately… last time I was there both ends were quite well locked up. It’s at the north end of the gardens near the Kirklee gate, behind the bushes. You’ll see the remains of the old railway bridge just outside the gardens, the cutting is to the south from there. After the first station at the botanics before we decided to turn back due to lack of light ( we weren’t really prepared to go in ) heading back today thoe with torches and such so will post pictures then ! I plan to make a trip to Glasgow to visit the botanic gardens on Tuesday, would you be able to give me any directions to entrances that will get you into the tunnels! I’m doing a shoot for my photography project there, and any information would be really valuable! I’ve replied to your comment because it’s the most recent one on the thread! The Kirklee one can be accessed through the Botanic Gardens. Going in at the entrance nearest Kelvin Walkway (rather than the Queen Margaret Drive one) and on the left hand side there’s a well trodden path amongst the trees that takes you straight there. At the the end of the platforms you’ll see the boards that need to be climbed over to get to the Botanics platform. Kelvinbridge station is easy enough to get to but it involves climbing through some fences and wooded areas. The bridge after Kirklee bridge (as you walk towards Maryhill Locks) has, again, a well trodden path going up towards the woods. Go up it and climb through the various fences and voila, you’re there. It’s mainly overgrown weeds but you can get onto the bridge but the tunnel at the end is now securely locked. We explored these areas as kids early 7th. Great summers. I was there yesterday,I found many ways in anyone know which ways the easiest route to take!? Who knows how to get in to this where is the entrance to get in to this ???? Used to play there as kids, about 1974. We spent a lot of time in derelict buildings. So much fun. This is amazing, how did you create the 3D model? Do you have plans from the site? I’d love to look at plans of it for my university project if you could help! Just fascinating for someone who was brought up in the area. I remember the Station and Silver Slipper Cafe! Thank you for the photos and information. Shame it is unused and so much now built upon the line as it would be a great commuter line and hopefully take a lot of traffic off very busy routes! To anyone interested. I went down today and you can enter through the Kirklee tunnel, it seems that someone has prised it open! It was really cool to see it in person. As above says : it’s actually very easy to access the Botanics Station platforms at the moment. Open gate in the dancing. And then just walk through the tunnel to the disused platforms. I actually continued under GWR all the way to Kelvinbridge and then back again. I got some great photos. Thank you to this blogger for all the information. I’m hooked now. Where next….. Thanks for this great info! As a child my brothers & I went through this tunnel in the 1960’s. In 2015 I was back home & decided to go in again. I was in my mid 50’s & nearly died scrambling over the high sheeted walls at the Kirklee Stn end. Lucky there was some assistance in the form of rope & upended wrought iron fencing which acted as a ladder. But with my bad back I nearly fell over the other side & it’s well high, I would’ve needed an ambulance! I made it in, went right to the Bot Gdns station, past & as far as I could go the back again. It was dusk & as I was passing through the station I saw a solitary fox sitting on the other platform staring at me. It was epic! Back over the high fence & out into the Gardens to discover they were locked up! I don’t know how I scaled the perimeter fence sheesh those spikes are sharp & it nearly killed me hauling myself up & over the fence out onto the street. Boy I had the time of my life doing it! I couldn’t believe that after so long there I was back in the tunnel again! Glad to hear you enjoyed your return visit! Thanks for sharing, I love hearing stories like this. hey not sure if you still monitor this blog but I am studying architecture and i’ve chosen the botanic rail way station for my project. I was wondering if you know where i can access plans, sections etc. As of 17th February 2018 there is an outer fence preventing access to Kirklee platform and the entrance to the tunnel has been recently boarded up with steel doors and razor wire at top. Cant get access. All looks fairly recent. 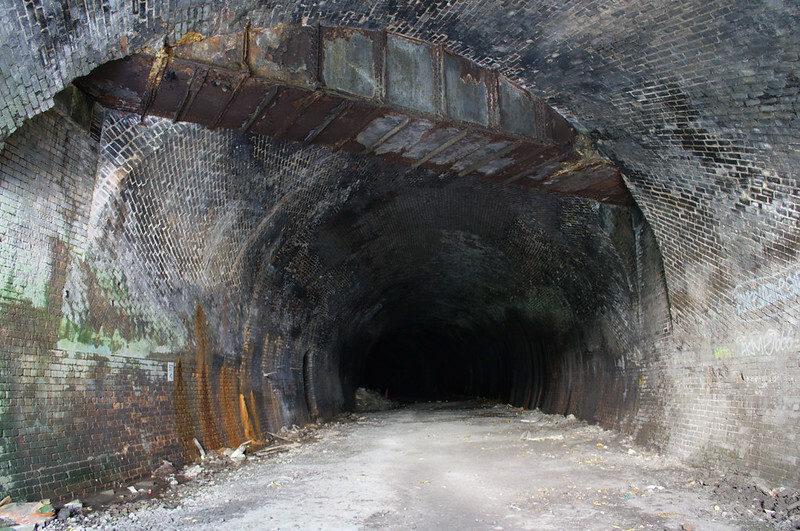 Such a shame that all of these tunnels are still structurally sound and are unused! The subway should invest in overground trains and make use of these. Can I ask- I remember being down at Partick Bridge by the Kelvin Hall and seeing what looked like another portal into KG park- is it part of an abandoned line? I’d love to see what that looks like too! Though I think the one you’re talking about may actually be the Yorkhill Tunnel, which I’ve never been able to get into. Hi, i read through comments and I’ve seen few people have already asked for it but I’m really intrigued about your 3D model of that tunnel. I’ve tried to find plans for that tunnel in few places but I’ve hit a wall.